Copied from a post over at the Daz 3D forums. [Can] anyone else who can answer this question. I was watching the book cover webinar that _manne_ did and I'm trying to wrap my head around the idea of rendering at 72 ppi inside DS and increasing the resolution to 300 ppi in a 2D program. Let's say that the final image size I need is 10 inches by 13 inches and I set my render image to those dimensions and render at 72. Do I understand correctly, then, that PS can increase the resolution to 300 ppi and that will work fine? Or do I need to render larger at 72 ppi inside DS and then increase the resolution and then scale down the image? How do you know that you have enough pixels to in an image size to increase the resolution like that? I'm not sure I'm explaining my confusion exactly. But, I'd like any info on this that anyone can tell me. Sorry that this is complicated, but printing terminology doesn't really sync up with the terminology used in 3D. As I would tell my students (and this is a generalization that I know will annoy some people who would rather speak in more precise terms about screen angles and image resolutions), but, simply put: A pixel is a dot and a dot is a pixel. Don't worry so much about pixel-per-inch or dots-per-inch. In very simple terms (and I don't mean to be insulting in any way), but at your technical level you can use those terms interchangeably. If you dive deeper into the topic, you can learn the distinctions later. Now, here's what you need to concentrate on: Always focus on the final, printed size of your image. 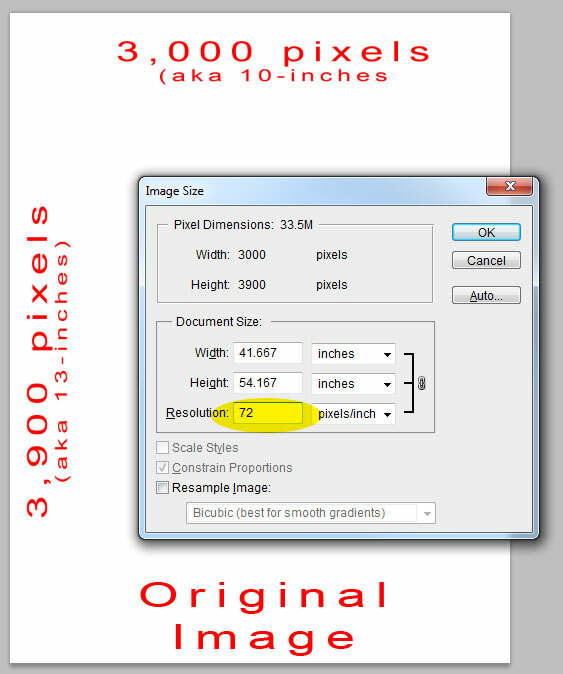 If you need an image to be 10 x 13 inches and you plan to print at 300 ppi, multiply those dimensions by 300. This will result in a final-target sized image of 3,000 x 3,900. Now, when you open Photoshop (GiMP, or whatever app you use), you are in for a shock. 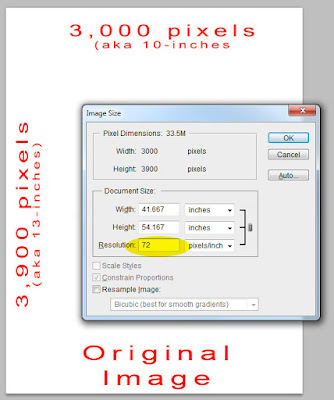 The image details might tell you that your image will print at 41.667 x 54.167 inches. Yeah. That's humongous. The reason it says that is simple: PNG and JPEG graphics do not automatically store the information needed to print the image. In other words, Daz Studio always outputs 72 dip. You can actually ignore this, if you want. It has no bearing on anything, other than your sanity. 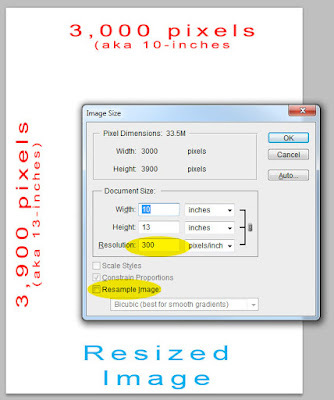 So, if you want to add the printed size to your graphic (thus returning it to the realm of the reasonably sized graphics), you may do so by opening the Image > Image Size... menu in Photoshop (I know this is also in GiMP, but don't recall where). You will see the following. This is where you will change the Document size. Make ABSOLUTELY SURE the "Resample Image" box is NOT CHECKED. Then change the 72 to 300. 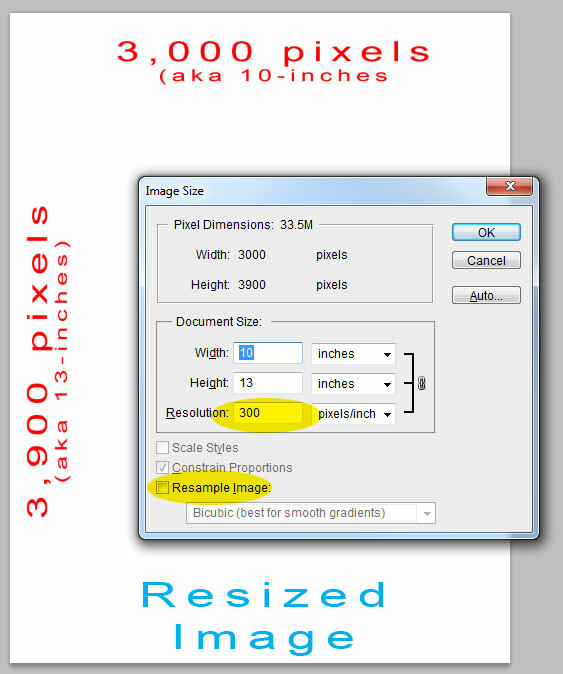 You will see that the Pixel Dimensions do not change, but that the Document Size does (see image below). The save your image again (probably as a PSD or TIFF). And that's it. I cannot stress how important it is NOT to resample the image. You can destroy your work by resampling at this stage (it's okay to do it later, but not here).